It is also mentioned in our previous post which was a transcript of the video. These questions are a great way to learn more about yourself, and you should probably answer them again every few months to a year to see how your experiences have changed or stayed the same. This is also a good way to introduce yourself to the community. So of course feel free to copy and use them wherever you’d like to. 1) What is your Screen Name/Therian Name? 2) Are you a Standard Therian (one therioside) or Polytherian (multiple theriosides)? 3) What species is your Therioside/Kintype? List multiple if you have more than one. 4) Are you able to make the vocalizations of your Therioside/Kintype? 5) Are you a Spiritual Therian or Psychological Therian or Both? 7) How long have you been awakened? 8) What shifts (if any) have you experienced? 9) How did you discover/conclude that you were a Therianthrope? It’s okay to say you are still learning/questioning. 10) What does Therianthropy/being a Therian mean to you? 11) If you choose to, share one embarrassing moment due to being a Therian. 12) What hobbies do you enjoy? 3) Primarily fox, secondarily rabbit. I have aspects or “other parts of myself” which are unicorn and dragonness, however I do not consider those to be therian types, but kintypes, though unicorn is pretty close to being a horse when it comes to what you feel. 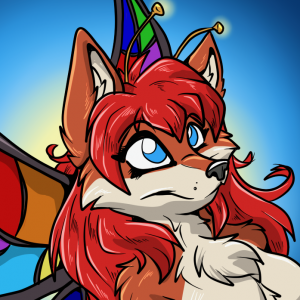 Being fae is part of ALL of the previously mentioned types. 4) For fox, yes, most of them. Rabbits usually live in silence. The other two, well unicorns don’t usually talk like horses and dragons just talk like dragons. 5) Both. I believe ones spiritual history have a direct effect on the type of mind you will develop during life, because the spirit influences the mind constantly. My belief primarily stems from the experience from how my own mind has developed. 6) My spirit is primarily one of a fae-fox. I noted at a very early age that my mind worked very different from others, and from the ages 7-16 I didn’t even have any internet so I kinda believed I was alone with that. 7) I can trace my first awakening event to when I was 7 but won’t describe it in detail on a public Tumblr. So about 33 years now. Once I got internet access at around 17 it still took me a year to find the therian and otherkin communities, and that was about 24 years ago now. 8) All of those, but as I understand cameo, thats like temporarily shifting into something else.. I do feel that some aspects of myself allow for some measure of shapeshifting, but I suppose most of them, I don’t try to trigger on my own. I don’t know all the new terms well. 9) I didn’t even know what therianthropy was until I got on the internet and even then it wasn’t defined as therianthropy, it was more an extension of being a “were-creature”. The word “therianthropy” didn’t come till later. There used to be some documents out there that described therian experiences like superliminal limbs and atypical urges (wont get into detail here) and many of my experiences mirrored what was documented. Discovering specifically what I am was more about learning about animals and comparing their traits to my own, and having alot of feline and canine traits, combined with the color patterns I saw in meditations and introspections drew me to the conclusion that I am more foxlike than anything. Before introspection I didn’t really have the context of what a fox is, and went between animals that had some of the traits I felt and experienced. I knew early on that I had multiple tails, which was confusing to me at first until someone told me about kitsune (I did not know and back in 1997 or so it was not a common creature to know about), and most of the other things I had discovered about myself fell into place. The primary theriotype I identify as now, is the same one I have identified as for the last 20 years. 10) What it primarily means to me is that I am a fox (primarily), I feel fox things, I have fox instincts and sensations, and.. I’m not sure what else its supposed to mean to me. To me it’s always been what it is. 11) One time I was caught rolling around in my back yard, rubbing my head against the ground and that kind of stuff. That’s kind of mild but it will work. 12) I do things but I don’t know that I have a hobby.